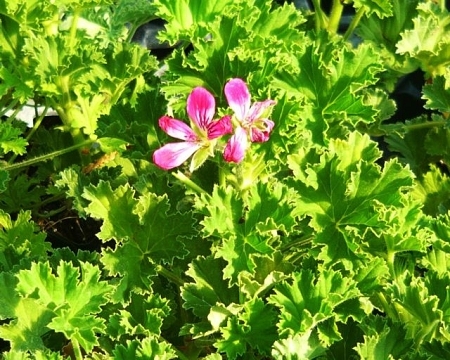 Pineappple (Brilliant) Scented Geranium (pelargonium) - Rounded leathery dark green leaves are said to have the faint scent of canned pinepple. Also called "Brilliant", which seems to be a much better description due to it's large showy pink flowers when it is in bloom. Plant is similar in appearance to Lime (pink champagne) scented geranium with more of a shrubby, compact habit. Full sun, well drained soil. Perennial zone 11+ Live plant in 3 inch container.